Detained Chittagong City Corporation Mayor ABM Mohiuddin Chowdhury was admitted to Chittagong Medical College Hospital (CMCH) yesterday after he fell sick in prison. He was rushed to Chittagong from Bandarban Jail as he complained of heart complications and difficulties in urinating at around 12:30am. The ambulance carrying the port city mayor reached Chittagong Central Jail at around 2:40am and was sent to CMCH from there. He was taken to the Coronary Care Unit (CCU) where the physicians immediately conducted primary examination on him. A 10-member medical board was formed headed by Dr Monzoor Morshed Mahmud, the head of the CMCH cardiology department, and comprised of specialists for his treatment. At a press briefing, Dr Monzoor said that when Mohiuddin was brought to the hospital he was complaining of pain in the chest and lower abdomen, respiratory problems and nausea. He was also suffering from insomnia and eye problems, he added. There was some improvement in his condition by afternoon, the concerned doctors at CMCH said. The medical board was to sit again to examine his condition as soon as the reports of different medical tests carried on him are available, the sources in the medical board said. Meanwhile, the mayor's wife Hasina Mohiuddin and their four daughters met him early in the morning after they obtained necessary permissions from district and police administration and jail authorities concerned. Mohiuddin was arrested by the joint forces from his Chashma Hill house in Sholashahar on March 7 and sent to Chittagong Central Jail. 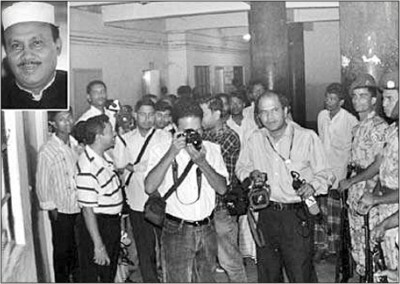 He was shifted to Bandarban Jail on March 9.